Before anything else, we would like to take the opportunity to congratulate you on your upcoming engagement. We may not know who your partner is but one thing is sure, everyone will always be captured by the beauty of any jewelry. Getting the perfect engagement ring may be an overwhelming and daunting task. The purchase is often accompanied by a lot of pressure. Most men who are in the search for the perfect yet cheap engagement ring would often find themselves lost in the colossal world of jewelry. It may practically be the first time they ever buy something fancy for a woman. Not only that, it is also possible that they get more confused and pressured with terms and concepts they have not heard before. But if you are truly ready for a lifetime commitment, nothing should stop you from fulfilling your goals. An engagement ring can symbolize your genuine love towards your partner. It can also be considered as a token for your brave decision of taking your relationship to a whole new level. 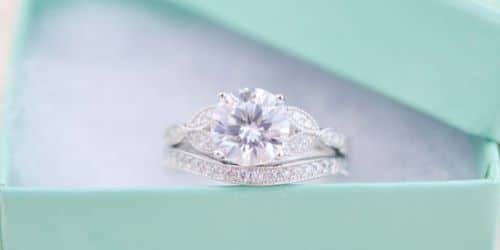 Without further ado, let’s us discover everything about engagement rings and help you make a wise decision in choosing one. 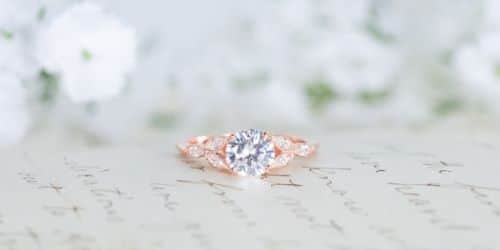 An engagement ring can basically come in different gemstones: diamond engagement rings, sapphire engagement rings, morganite engagement rings, opal engagement rings and many more. The most commonly used engagement ring is the diamond ring. In fact, 75% of British men opt for a diamond engagement ring. If you want to try something new and unique, you can also choose from black diamond engagement rings. Diamonds and sapphires are perfect options for the engagement ring because they are two of the hardest stones on earth. Diamond is on rank no. 10 while sapphire is on rank no. 9 based on the Mohs scale of hardness. A diamond ring comes in 10 different standard shapes but the most sought-after shape is round. However, because of its popularity round diamond rings also cost more compared to the others. Typically, metals used for engagement rings are gold and platinum. Gold comes in three main colors: yellow, rose, and white. Both are expensive types of metal especially platinum since it is rarer than gold. Platinum is also more sturdy and durable but it costs 50% more than gold. Gold is also an expensive type of metal but there are many affordable options you can get. In order to get a cheap engagement ring, it is better to get rings with lower gold content like 9ct to 18ct. 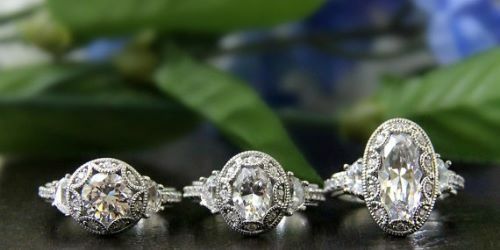 It may be hard to tell if your partner would appreciate vintage engagement rings or modern ones. If she loves movies, books, and history which are all centered in the past, chances are that she would appreciate an antique or a vintage ring more than modern rings. Not only do these rings carry a ton of meaning and history, they may also cost less. When getting the perfect engagement ring, it is important to make your future fiancée satisfied as well as your pocket. Let’s face it, not everyone has the luxury to spend a huge amount of money on fancy things when it can be used for something more beneficial. Why should you spend a fortune on this big decision when you can get an engagement ring for a low price? This beautiful engagement ring is a GUARANTEED Solid 925 Sterling Silver authenticated with a 925 Stamp. Made from the highest CZ Cubic Zirconia. 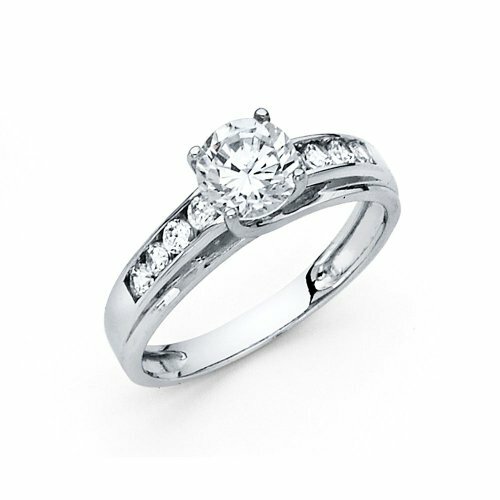 The 3 three stone cheap engagement rings have Princess Cut Solitaire with a mixture of Round Side Stones of 1.75cttw,. and 1.5t. Center. It’s available in all ring sizes on Amazon (sizes 4 – 9.5). It’s sold in an elegant Velvet Ring Box – comes with FREE Standard Shipping and has amassed a rating of 4.7 out of 5 from verified customers who have purchased it in the past. The classic and traditional 925 refined Solid Sterling Silver Minxwinx comes with a brillant cut made from top quality Cubic Zirconias. Made with 100% handset stones with no glued crystals – you’re going to love this engagement ring. It also features 1 Micron thick anti-tarnish platinum-rhodium overlay. This ring has a 30 Day Return Policy and has so far gotten a perfect rating of 5 out of 5 from customers. 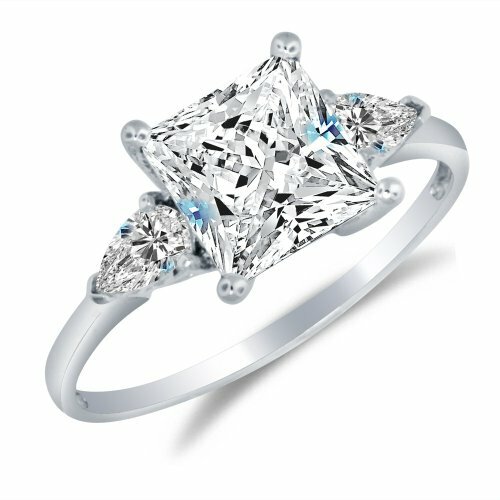 Made as a shiny crown classic fine diamond, this Superhai Engagement Ring is the perfect gift for your female friend. It has a glamorous shine which will give you a high like you have never felt before. There is an inlaid natural Zircon that sparkles easily and clearly when its worn. It has a perfect rating of 5 on Amazon. 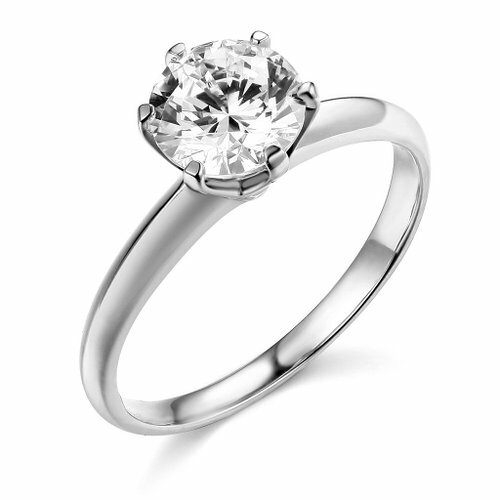 This round solitaire engagement ring can also be a perfect Valentines gift. It is done in a vintage style with 925 Sterling Silver .75ct, Rhodium Plating and milgrain. It features a 5mm CZ center stone and 2mm band width with a 10mm ring face. It has a rating of 3.8 on Amazon. This ring is made of solid Sterling Silver .925. It has high-quality Cubic Zirconia and includes FREE ring box. Enjoy its 30-Day money back guarantee. This ring has a rating of 4.4 on Amazon. 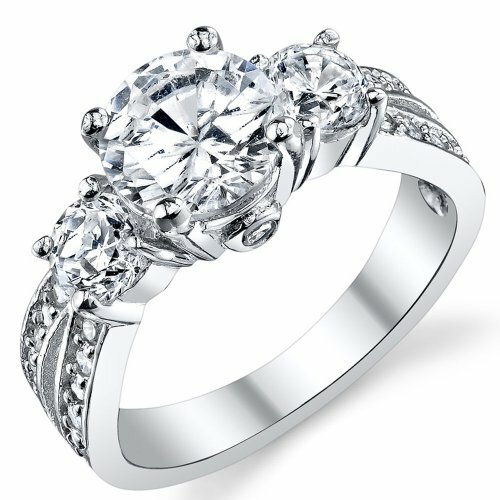 This is an elegantly beautiful large stone stainless steel Cubic Zirconia engagement ring. It features AAA Grade CZ. Its center stone size is approximately 10mm-12mm. Its weight is approximately 6.00(g). It has a perfect rating of 5 on Amazon. 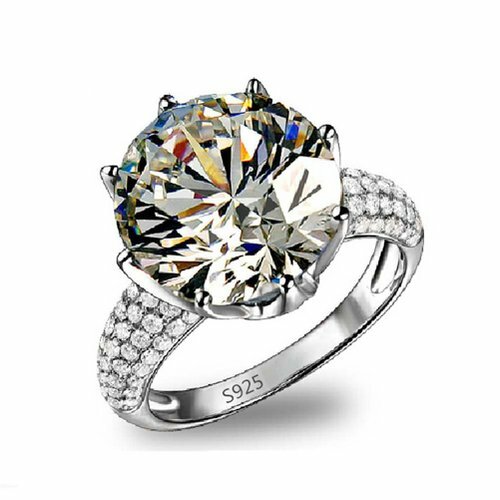 This Rhodium Plated 925 Sterling Silver Cubic Zirconia simulated Diamond Classic engagement ring is stamped with S925 so as to ensure genuine sterling silver. It has AAA-quality with round brilliant-cut cubic zirconia stones. Its Nickel-free, lead-free and allergy free guaranteed. It comes with a velvet drawstring pouch for gift giving or for easy storage. It is available in a variety of sizes. It has a rating of 4.6 on Amazon. 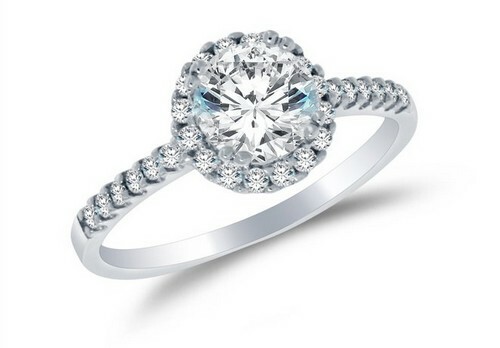 This Sterling silver ring features a three round-cut cubic zirconia at the center (2.3 cttw). It is a unique gift for your girlfriend, daughter or for yourself. It has a rating of 4.3 on Amazon. This engagement ring is made of .925 Sterling Silver. 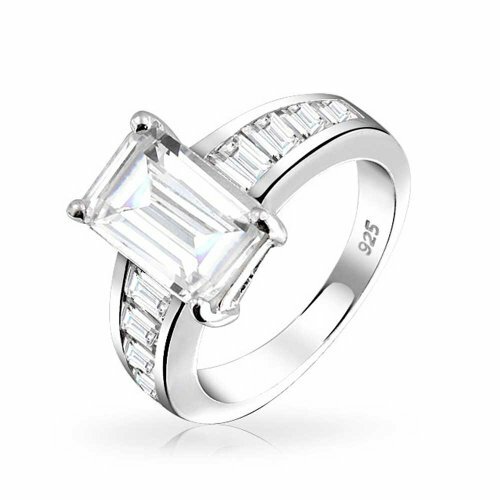 It has Asscher Emerald Cut and Round Cut CZ. It has a band width of 2mm and 14mm face. It has a rating of 5 on Amazon. 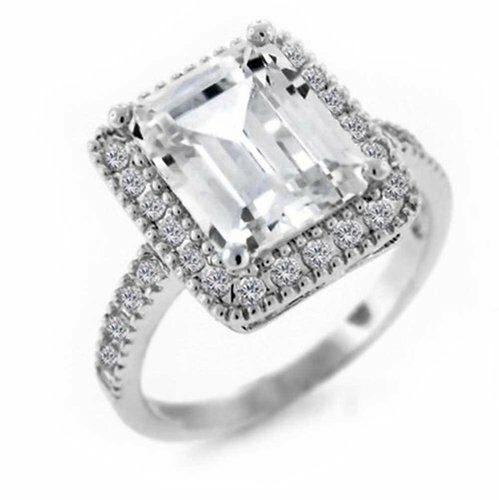 This is a vintage style Emerald Cut CZ engagement ring in Sterling Silver. The width of the band is 2.5mm. 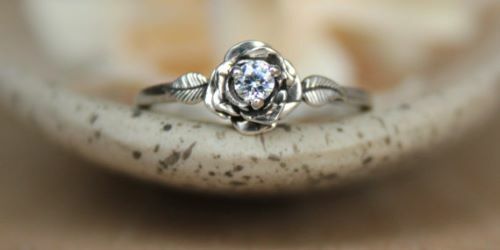 This is a unique and beautiful engagement ring for your girlfriend. It has a rating of 4.2 on Amazon. 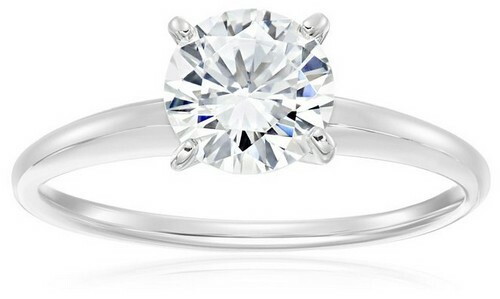 This classic ring is made of sterling silver and round-cut Cubic Zirconia Solitaire (1 cttw). 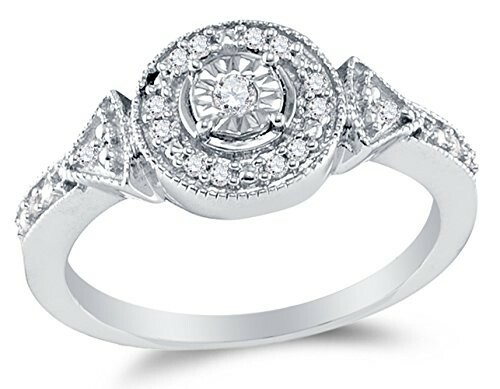 It features a dazzling prong-set cubic zirconia set on a polished sterling silver shank. This product is imported and has a rating of 4.8 on Amazon. This wedding engagement ring is made of .925 Sterling silver rhodium plated. 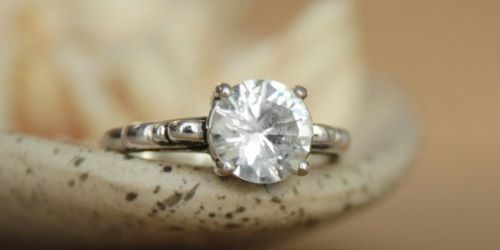 It has a band width of 2.5 mm and the center stone is 1 carat. It has the highest quality with AAA grade Cubic Zirconia. It is carefully packaged in a free gift box. This product has a rating of 4.8 on Amazon. This engagement ring has 18k gold over silver. It has 2.00 Carat NSCD diamond with D color and VVS1 Clarity. 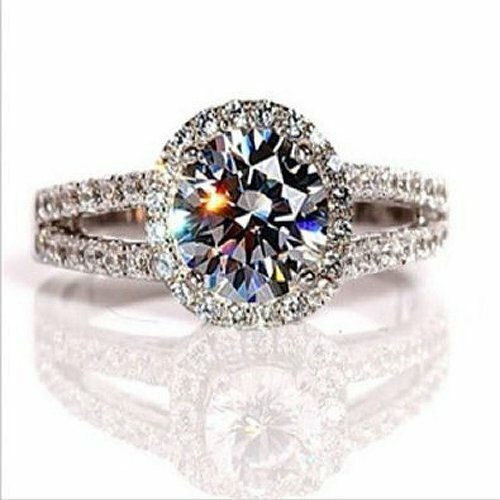 This is an amazing engagement ring for your girlfriend. It has a 4.5 rating on Amazon. 14. 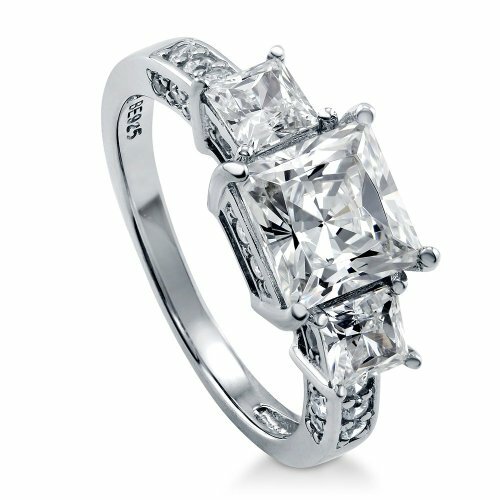 Sonia Jewels Solid 925 Sterling Silver Engagement Ring 1.75Ct. This engagement ring 1.75ct. 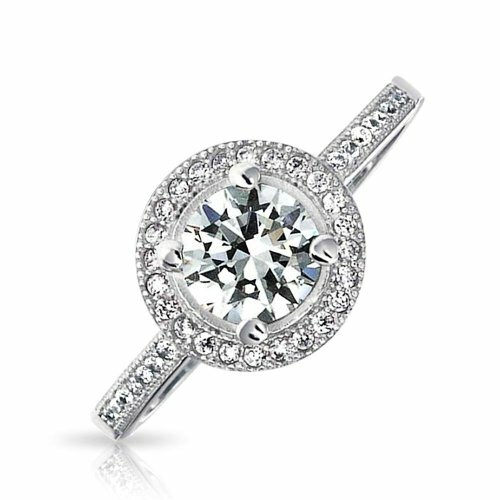 is a classic traditional round brilliant cut solitaire with the highest quality CZ Cubic Zirconia. It comes with an elegant velvet ring box. It has a free standard shipping. This ring is authenticated with a 925 Stamp. It has an Amazon rating of 5. 15. 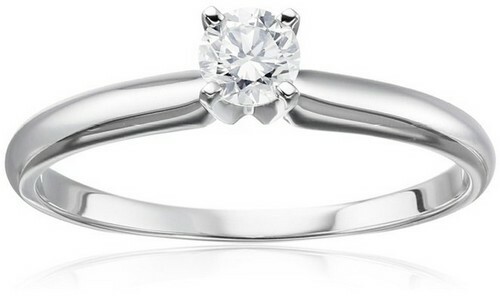 Sonia Jewels Solid 925 Sterling Silver Engagement Ring 3.5Ct. 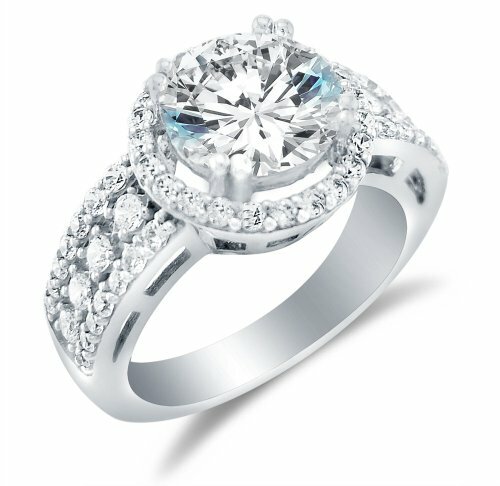 This 3.5ct engagement ring is made of solid 925 sterling silver with huge wide round brilliant cut solitaire with round side stones. It is made from the highest quality CZ Cubic Zirconia and it includes an elegant velvet ring box. It has an Amazon rating of 4.8. 16. Sonia Jewels Solid 925 Sterling Silver Engagement Ring 2.5Ct. This is a 2.5ct. engagement ring with a solid 925 sterling silver. It has three stone oval shape solitaire with oval and round side stones. It is crafted from the highest quality CZ Cubic Zirconia. It comes with an elegant velvet ring box. It has a perfect rating of 5 on Amazon. 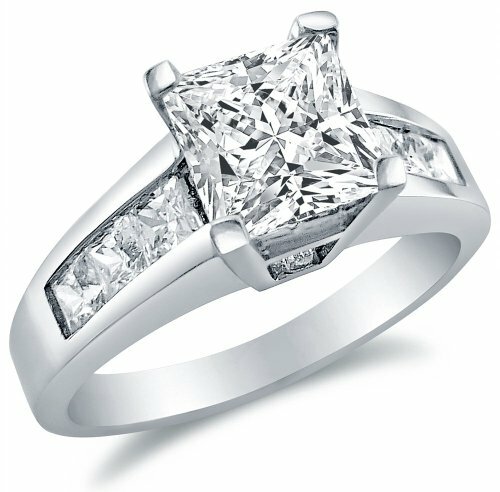 This is a 2.0 ct engagement ring with a solid 925 sterling silver ladies princess cut. It is made from the highest quality CZ Cubic Zirconia. It includes a beautiful velvet ring box. It has a rating of 4 on Amazon. 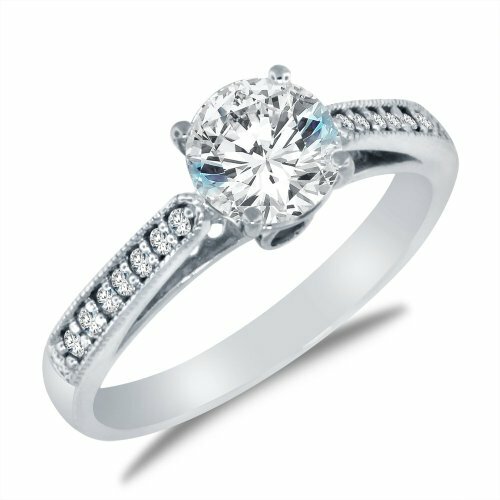 This is a solid 925 sterling silver halo engagement ring with the highest quality CZ Cubic Zirconia. 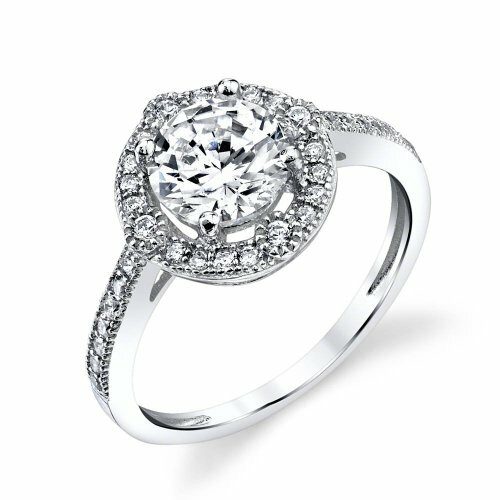 It features round brilliant cut solitaire with round side stones (1.5cttw., 1.0ct. Center). It is available in all ring sizes 4-9.5. It also includes a lovely velvet ring box. It has a 4.8 rating on Amazon. 19. 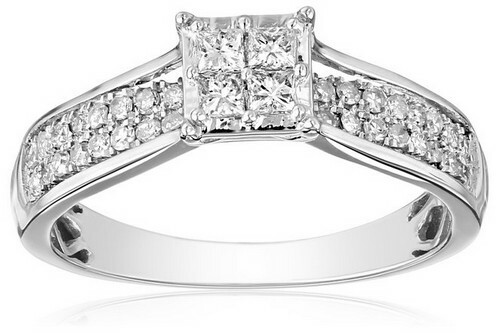 Sonia Jewels Solid 925 Sterling Silver Princess Cut Engagement Ring 1.75Ct. This is a 1.75ct. engagement ring with solid 925 sterling silver princess cut solitaire with princess cut side stones. It is crafted from the highest quality CZ Cubic Zirconia. It comes with an elegant velvet ring box. It has a 4.8 rating on Amazon. 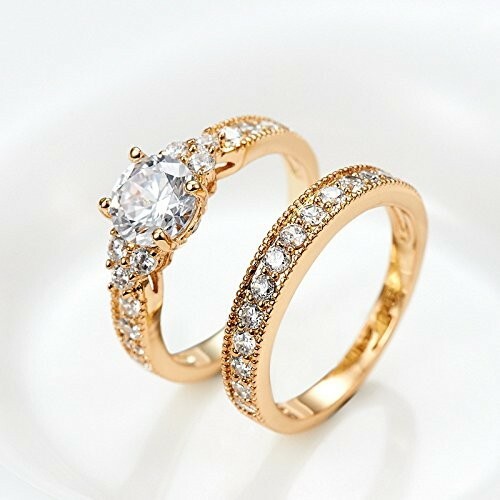 This is an 18K gold plated zircon engagement ring. It is lightweight and has a gentle and elegant design. This is anti-allergy, anti-rust and does not fade right away. 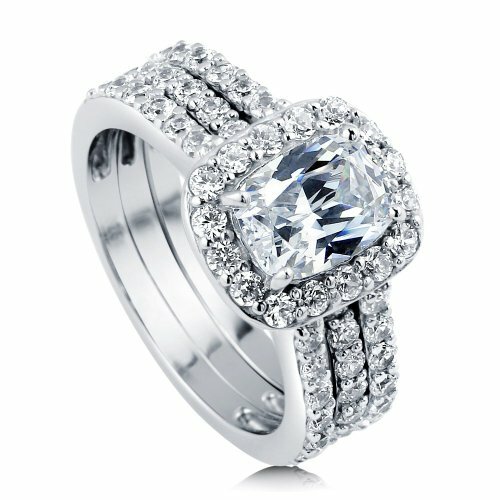 This is a 925 Sterling silver 3.13 ct.tw engagement wedding ring with Princess Cubic Zirconia CZ 3 Stone. It is rhodium plated and nickel free. 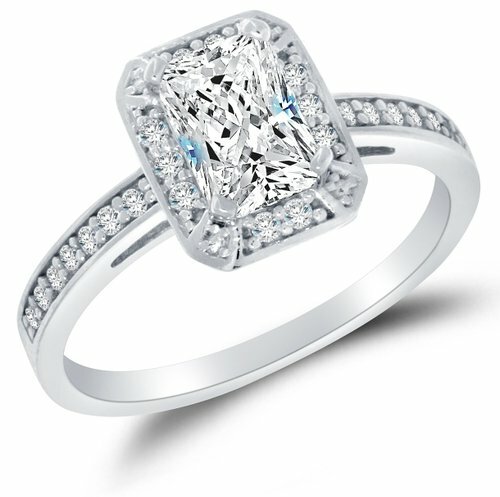 The center stone is a princess cut cubic zirconia (2 ct.tw; 7mm). The accent stone is cubic zirconia (1.13 ct.tw). The width of the band is 2mm and has a rating of 4.6 on Amazon. 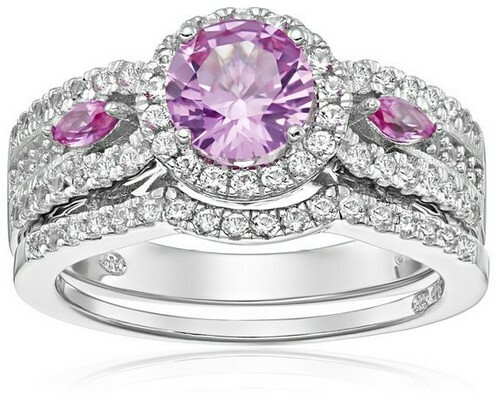 This is a Sterling Silver engagement ring with pink and white Sapphire. It is available in size 7. This ring is imported and has an Amazon rating of 4.8. This engagement ring is made of Sterling Silver Created White Sapphire. It is available in size 8. It has an Amazon rating of 4. This is a set of two engagement rings. One ring is highlighted by a princess-cut Blue Zircon. The other ring is surrounded by the dazzling Blue Zircon. It is available is sizes 5-11. 25. Sonia Jewels Solid 14K White Engagement Ring 1.5Ct. This is a 1.5 ct. engagement ring with solid 14k white or yellow gold milgrain band. 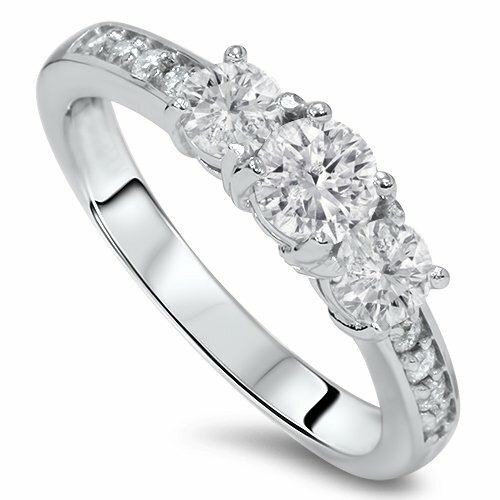 It features a round brilliant cut solitaire with round side stones. It has the highest quality CZ Cubic Zirconia. This ring has a rating of 4.8 on Amazon. You can ensure that this ring is made of pure, genuine and natural diamonds. It comes with a sophisticated velvet ring box. 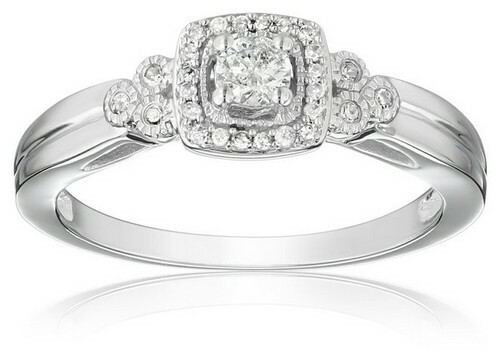 This halo engagement ring has a solid 14k white gold highest quality CZ cubic zirconia. It features an emerald-cut / shape solitaire with round side stones (1.25cttw., 1.0ct. Center). It comes with a nice velvet ring box and free standard shipping. It is authenticated with a 14k stamp. It has a rating of 4.8 on Amazon. This ring has 10k White Gold 1/10cttw White Diamond. It has a ring size 7. This product ships from and sold by Amazon.com. It has a rating of 5 on Amazon. 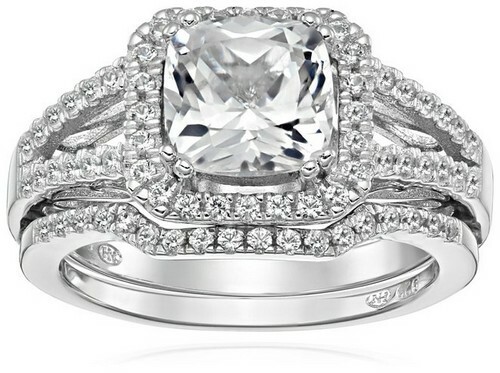 This halo engagement wedding ring set is made of Sterling silver 2.62 ct.tw with cushion Cubic Zirconia CZ. The metal is 925 sterling silver, rhodium plated, and nickel free. The center stone is cushion cut cubic zirconia (1.5 ct.tw; 8mm x 6mm). The accent stone is cubic zirconia (1.12 ct.tw). The Band Width is 8mm. This item has an Amazon rating of 4.5. This is a 14k yellow or white gold solid wedding engagement ring. The metal used is white-gold. The width of the band is 2.5 mm. The center stone is 1 carat AAA grade Cubic Zirconia. It is packed in a free gift box. It has an Amazon rating of 4.6. 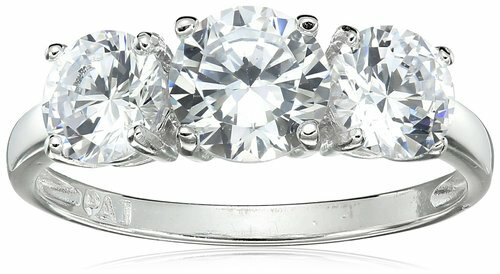 This is a 10k white gold diamond engagement ring (1/4 cttw, I-J Color, I2-I3 Clarity). The Amazon Curated Collection is composed of the finest jewelry. They have an expansive selection of high-quality jewelry which offers everyday values. This jewelry collection can range from precious gemstone, diamond pieces to the newest fashion designs. This product has a rating of 4.3 on Amazon. 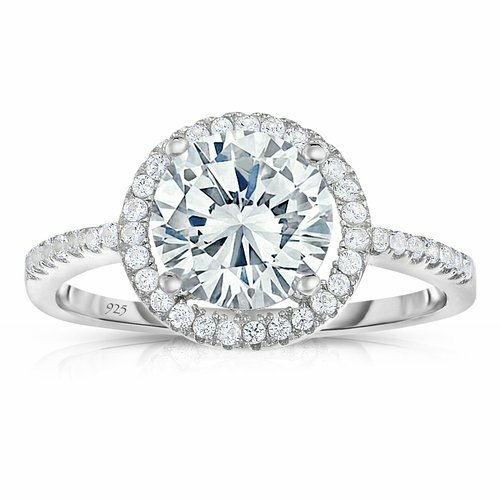 This engagement ring has a 14k white gold round solitaire diamond (1/4 cttw, H-I Color, I2-I3 Clarity). The Amazon Curated Collection features a variety of diamond, gemstone, and precious metal designs. This ring has an Amazon rating of 4.5. 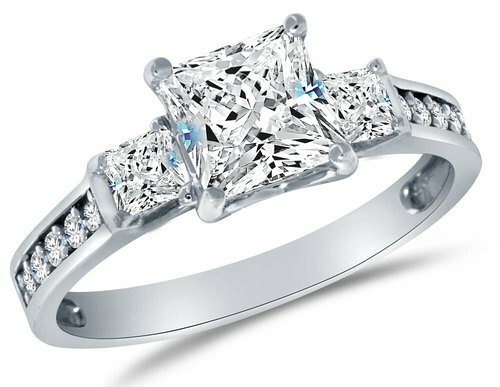 This is a 14k white gold ring which features four princess-cut diamonds at the center and double-row of diamonds on the band. The diamonds used here are conflict-free since the suppliers are complying with the Kimberley Process. This is an imported ring with an Amazon rating of 4. 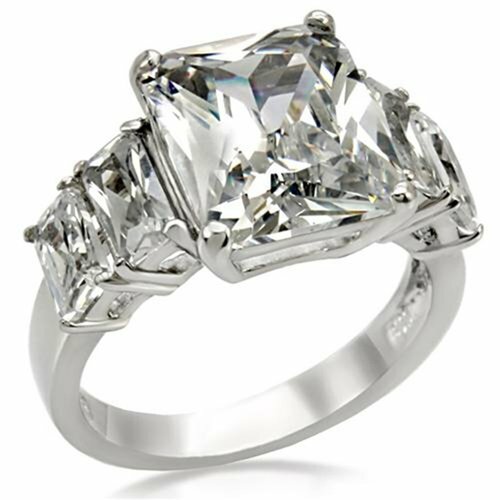 This engagement ring has a 10K white gold and 1 cttw diamond 3 three stones. It comes with a 30-day money back guarantee with a lifetime warranty. These diamonds are conflict free. It includes a free gift box and free shipping. It has an Amazon rating of 4.4. 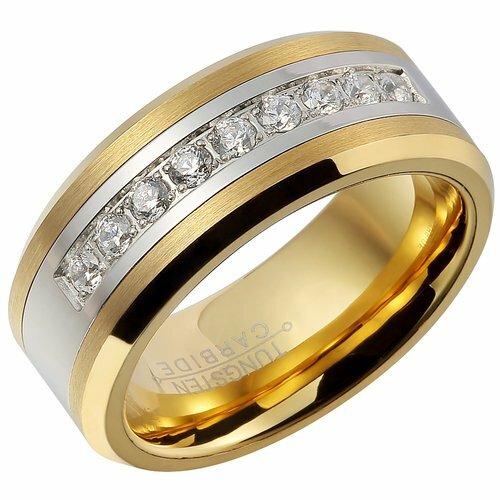 This is a 14k Yellow Gold Wedding Engagement Ring with a width of 2.5 mm on the band. On the center is a 1 carat AAA grade Cubic Zirconia. It is nicely packed in a free gift box. It has an Amazon rating of 4.3. 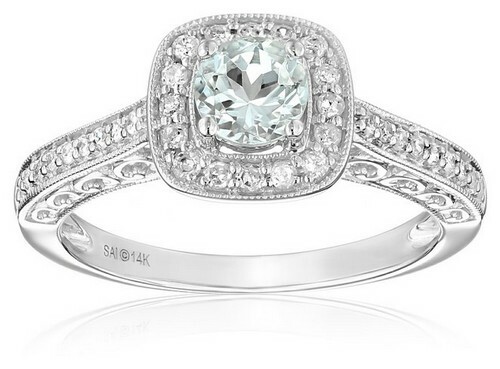 This is a 14k white gold aquamarine and diamond ring (1/4 cttw, H-I Color, I2-I3 Clarity). It is available in size 7. This white gold engagement ring is being accented with diamonds and features round aquamarine stone with small white diamonds in the center. It has swirling filigree and an inner band. These diamonds are conflict-free. This ring is imported and has a rating of 4.5 on Amazon. This ring is made of solid Titanium with a sophisticated horizontal brushed center. It has 8mm wide, raised center, and beveled edges. It is accented by deep blue princess cut cubic Zirconia. It has a 30-Day money back guarantee and an Amazon rating of 4.5. Tungsten Carbide is a type of material which is tough, heavy-weight, hypoallergenic and tarnish resistant. High technology coatings are being applied to the metal in order to make it highly scratch-resistant. The raised center emphasizes the matte finish. 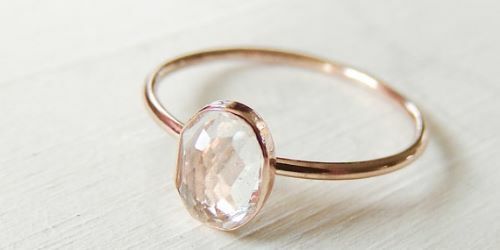 This is a simple yet elegant ring. It has an 8mm width. 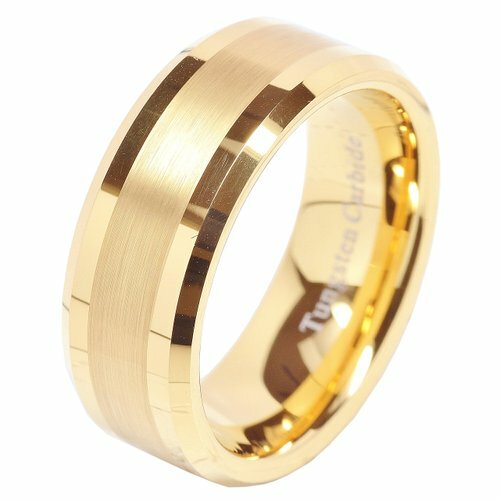 This is a strong and powerful wedding band to symbolize your love It has a rose gold design on the interior. The inner smooth arc design gives you a perfect comfort fit. It has a 4.8 rating on Amazon. 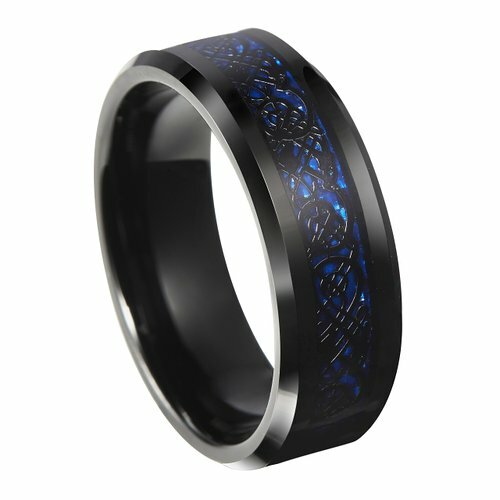 This is a black Celtic dragon ring in black colored tungsten carbide with a blue background. It is cobalt free, scratch resistant and it has a comfort fit. It has an 8mm width and 2.3mm(approx) thickness. It can be worn by men or women. It comes with a wedding ring box. This item has an Amazon rating of 4. This ring is made from high-quality titanium, which is a very strong and lightweight metal. 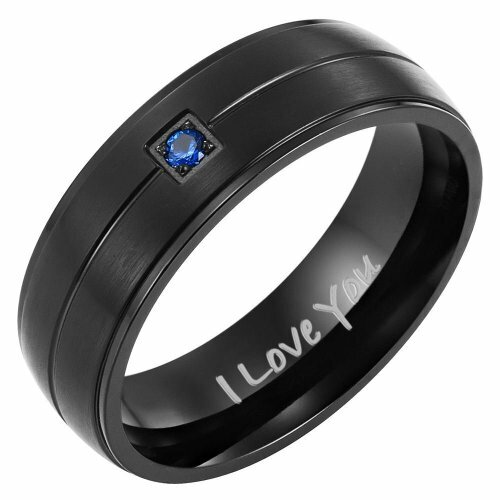 Inside the ring is an engraved “I Love You” which makes it ideal for gifts. It comes with a free Premium Willis Judd gift box. It features a CZ stone which makes it looks cool on a black titanium. It has a rating of 4 on Amazon. 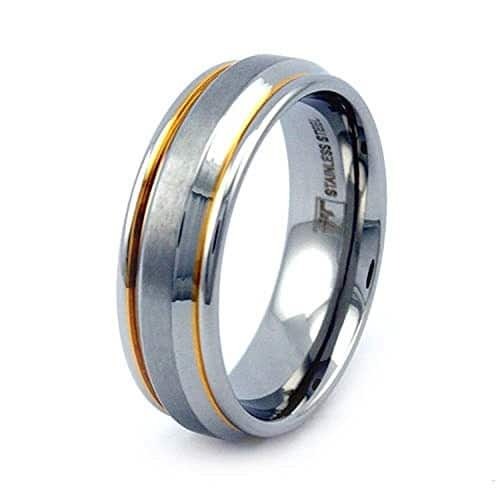 This Tungsten ring is highly polished and scratch and fade resistant. 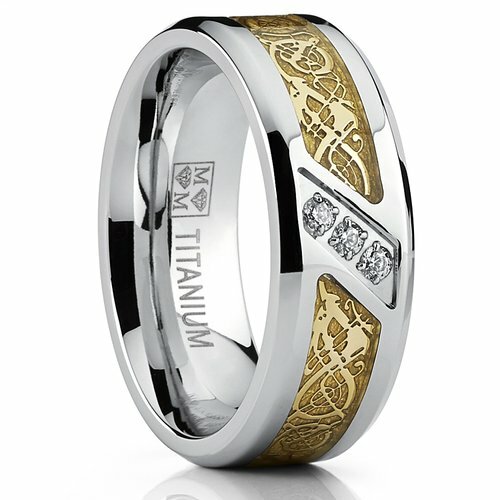 It is a classic Style which is now the latest alternative to gold or platinum ring. It is the best gift for wedding, engagement or anniversary. It includes a wedding ring box. It has a rating of 4.7 on Amazon. This is a high-quality Tungsten carbide ring with comfort fit and beveled edge. It is scratch resistant and water proof. This product has a rating of 4.7 on Amazon. 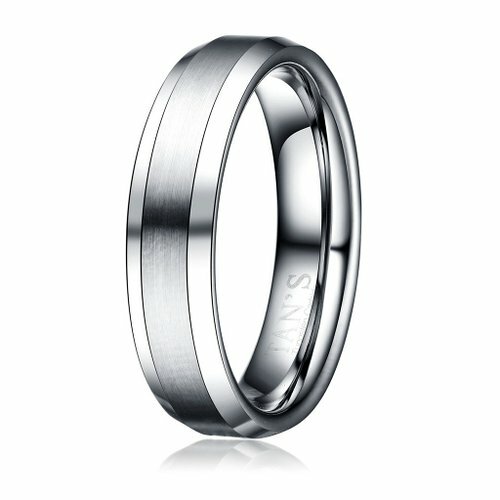 This is a 6mm Tungsten ring wedding band in a comfort fit. It features a brushed matte finish and beveled polished edge. It is a classic design which can make you look sophisticated. It has an exquisite craftsmanship which makes it a perfect gift for engagement, wedding, Christmas, Valentine’s and other occasions. This product has a rating of 4.3 on Amazon. 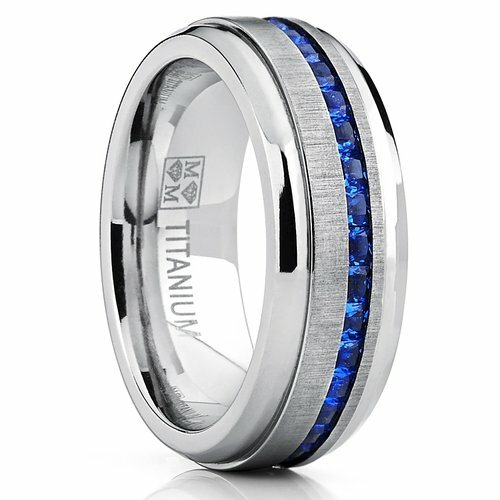 This ring is made of genuine solid Titanium. It has a dragon inlay with round cubic Zirconia. It is an 8mm lightweight ring with a comfort fit. It has high polish beveled edges and include a free ring box. It comes with 30-day money back guarantee. This product has a 4.9 rating on Amazon. 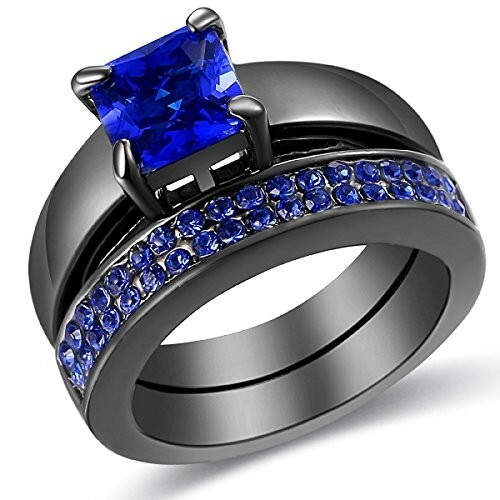 This ring is crafted from solid cobalt chrome and 100 % hypoallergenic. It features high polish beveled edges, comfort fit, and scratch resistant. It has a gray carbon fiber inlay. It comes with a free ring box. It has an Amazon rating of 4.9. 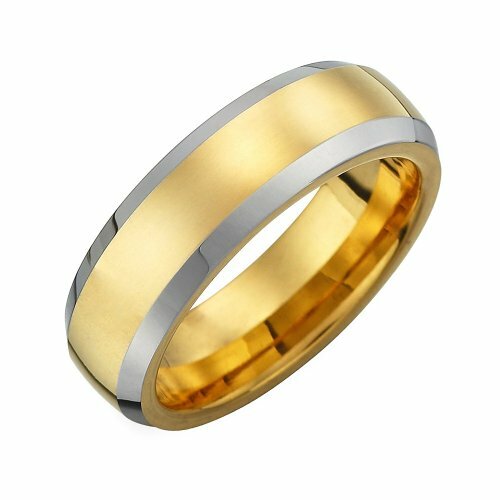 This is a genuine Tungsten ring with 12 kinds of sizes available. Its width is 8mm and it has a perfect comfort fit. The inner part is polished and you cannot feel any nickel ingredients. This ring is also hypoallergenic. It comes with a 30-day Money Back or Exchange Guarantee. It has an Amazon rating of 5. 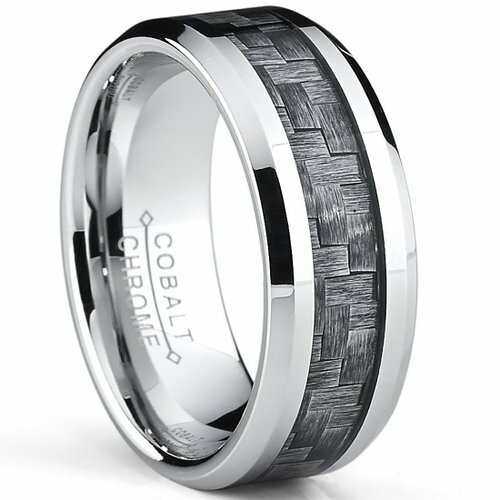 This ring is crafted from Tungsten Carbide. It has a 4mm Titanium steel. It features 9 shiny cubic zirconia inlay which gives glamour to your dating. Its excellent inlay workmanship guarantees the firmness of stones. 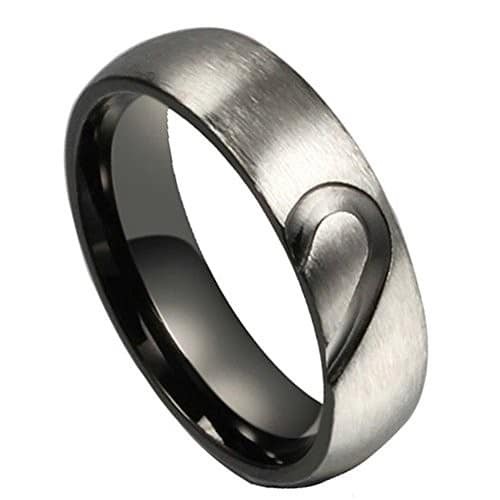 This 8mm wide band ring is ideal for men and women. It is available in sizes 6-13. In includes a ring box and a 30 Days Money Back Guarantee. It has a perfect rating of 5 on Amazon. The interior part of the ring is higly polished while the exterior part has a matte finish. Show your loved one how much you love them by giving them this elegant heart puzzle rings. 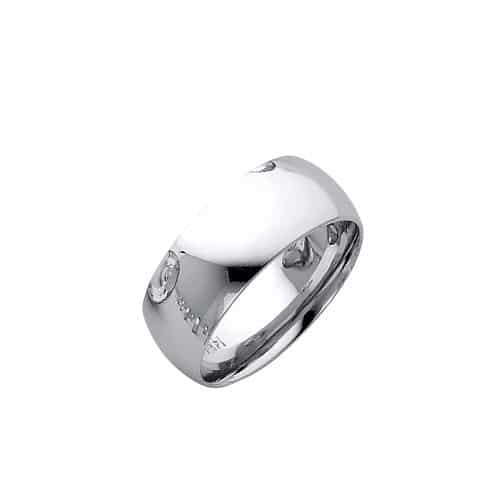 This elegant wedding ring is made of pure 316L stainless steel. It is a higly polished ring with gold plated edges. This ring has a width of 7mm. This ring has a width of 8 mm. It comes with a free standard shipping and packed in a free gift box. It has a perfect rating of 5 on Amazon. This engagement ring/wedding band is done in a classic silhouette. 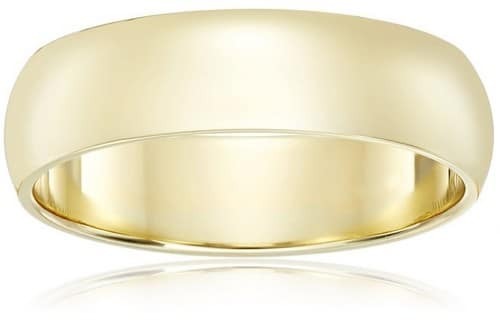 It features a polished gold finish with comfort fit design. It has rounded polished interior which can slide the ring easily and fits comfortably on the finger. Clean your gold jewelry by using warm water, mild soap, and a soft bristled brush. In order to avoid scratches and maintain it’s shine, avoid any contact with chlorine and other harsh chemicals. Keep your gold jewelry in fabric lined box. This product is made in the USA and has an Amazon rating of 4.7. This ring comes with an elegant free gift box. Why choose Tungsten? Tungsten is one of the strongest metals that is best for jewelry. This excellent wedding band or engagement ring for men has a width of 7 mm / 0.27 Inch (slim). It has a perfect rating of 5 on Amazon. When buying an engagement ring from a jeweler, there are some things you should consider. Of course, you would not want to buy from high street jewelers because they sell jewelry for a relatively higher price. Another thing to consider when buying a cheap engagement ring is the time of the year. You would want to buy jewelry on months when sales are typically on the low so you also get he ring for a lower price. For most jewelers, the peak season would be before Christmas and Valentine’s Day. The slowest month for jewelers would typically be August. You may just get a better and more affordable deal when the timing is better. In addition to these tips, you also have to hop from one jeweler to another so you can compare prices. Yes, we know it is a tedious task but if it would save you more money, why not go through it? When going from one store to another, you should have a checklist to look for. This would help you compare data better. Observe how expert the staffs are when it comes to gemological knowledge. Ensure that they also provide explanations for jargons. If they can provide certificates, do they provide the original or just a copy. Are they part of a trade association? If yes, which one? Does the store give out a detailed receipt? The receipt is primarily going to be useful for you in the future primarily for insurance claims or repair. Does the store allow customers to examine diamonds on a white background? 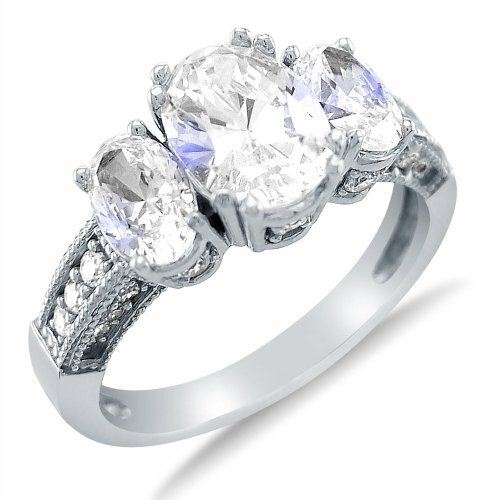 When buying cheap engagement rings online, it is important to check the reputation of the online store. You must buy an engagement ring on certified stores. In addition to that, you should also read the delivery terms. If you want to buy from an internationally-based store, you should also check information about tax and duty charges. 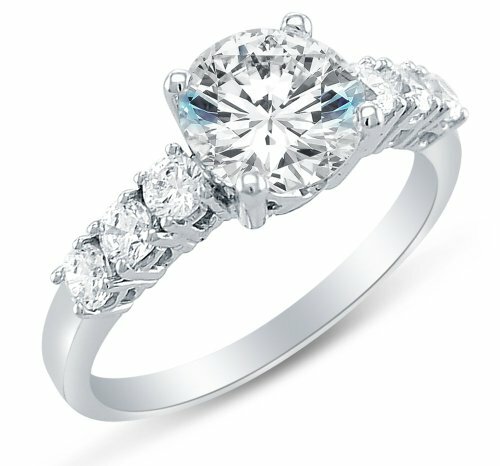 It is not hard to look for a valuable but affordable engagement ring. All you need is A Bloke’s Guide to Buying the Ring without Breaking the Bank. With engagement rings, love always meets budget. We hope the tips and inspirations here helped you decide.